It is but I doubt they care. Apparently, the footage for the Top Of The Tops performance of Paperback Writer and Rain has been found and will soon be released. Did you mean to post that in Beatles News, @Dark Overlord? Oh **** i did, i feel so stupid for posting in the wrong thread. Does anyone else hear this high-pitched noise in She Said She Said ? What is it? Is it a noise throughout the entire song, or only at a specific spot? It comes and goes throughout the song. That's guitar feedback right there, baby! It always makes me think of an oven timer. I love it. Adds so much to the vibe of the song. Did Ringo play the drums all the way through Tomorrow Never Knows or was it looped? I have heard that it was looped. It isn't looped. This is the point the jumper appears inside the drum for the first time. It was an overdub on take 3. It's part of the reason it's so highly praised. It's one of those examples of how Rings locks into a beat and rolls it around the kit. Very rare you hear the metronome go wrong. Doesn't dismiss the possibility of drop-ins on what we know, but nothing we know suggests there were any. As an overdub, I imagine a few runs and then there's the one. @QuarryMan , you're asking some good song questions. 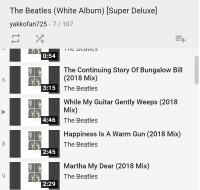 Would it be ok for me to move the posts to the threads about those songs? I think this question fits with what seems to be the tone of this thread, but if you want to move the discussion to the specific thread for the sake of posterity, sure! Actually, since the "move" function is broken at the moment, I can recreate the posts in the song threads and leave the original posts here. Win-win! The "Miscellaneous Question About..." threads were meant to prevent a new thread being created for every question that didn't comfortably sit in an existing thread, @QuarryMan. When there's an obvious place for the question, like a relevant song thread, it works better there as someone may have the same question and be looking at the relevant thread to see if they can find if it's been asked and answered there already. ...so i wondered if this is a "only in my country" thing or is just global? That's weird, especially since it's from the official channel. It worked fine for me. I'm using an American VPN. So apparently it's been a thing for a month?